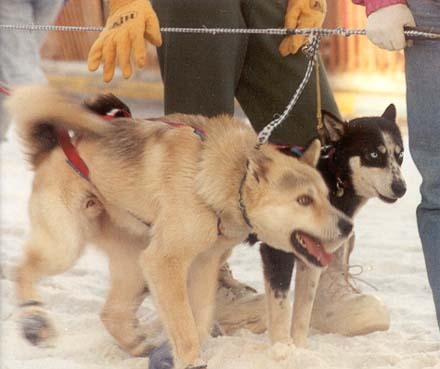 Dogs on short tethers before the Iditarod starts. Avon canceled the speech of Susan Butcher (four-time Iditarod race winner) at its convention for Avon representatives. Novartis stopped sponsoring a musher in the Iditarod. Wells Fargo, State Farm, The Transportation Security Administration (TSA), 5th Avenue Mall (Simon Property Group), Hills Brothers Brand (Nestle), Rite Aid, Carr-Gottstein Foods (Safeway), Maxwell House Brand (Kraft Foods), IDEXX, True Value Hardware, Golden Corral, Yupo Corporation, Interbake Foods, Sears, Cabela’s, Seagrams, Allworx (Windstream), Waste Management, Konica Minolta, Alaska Dispatch News, Guggenheim Partners, Jim Beam, and BP Amoco stopped sponsoring the race. Parker Brothers stopped production of Iditarod Monopoly. According to the Associated Press, royalties from this game increased the Iditarod prize pot by $30,000 in 1999. 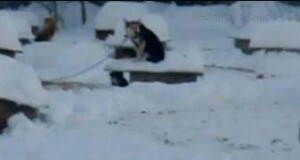 NUTRO PET PRODUCTS has stopped sponsoring a musher in the race. Dog shelters are buried in the snow. Tyson Foods, Hormel, Avis, H.J. Heinz and Ralston Purina, Eddie Bauer, Lands End, Hain-Celestial and Cabela’s stopped sponsoring mushers in the Iditarod. Pets.com removed an article from its website that promoted the Iditarod. Sherwin-Williams, Tropicana (Pepsico), Pizza Hut (Tricon Global Restaurants), Costco, Suiza Foods, Pfizer, Bausch & Lomb, Bank of America, Farmers Insurance, Jimmy Dean Food Company, and Pharmacia & Upjohn, Bayer and Fred Myer withdrew their sponsorships. New World Pasta (Hershey, minority shareholder) made a commitment to end its Iditarod involvement after the year 2000. Target ended its sponsorship of the Iditarod Teacher on the Trail program.